Thanks to the internet, I found at least 5 other bands that you have been in, and I know this must be the tip of the iceberg, has winning the US title for air guitar somehow helped these other side projects, or are you just going to give up playing 'real' guitar all together? What other seven inches have you played on or produced/recorded? See the above list (the * mark bands with records out). As for the biggest 7" offenders (in numbers) we have All You Can Eat = 11, WHN? = 10, Your Mother = 7. Do 10" count? I have a few of those too. I saw on your 'What happens next?' band site that you or someone said 'With all the yeah-or-neigh hoopla regarding colored vinyl, all I gotta say is colored vinyl sounds like crap.' Really? I've never compared but is that true? 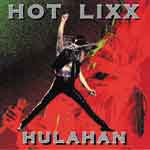 I guess there won't be a color 7" from hot lixx anytime soon. I would have put the HLH record on colored vinyl but it was already expensive enough for a record with no music. Colored vinyl (the kind you can see through) is made of a lesser material and truly sounds worse than standard and even recycled vinyl. But when you get those thick records with colors or tie-dye patterns or splatter designs those are usually OK. Basically if you can see through the record at all you've got poor vinyl. How did the idea come about for this seven inch? I've been putting out useless 7" for 15 years now, it seemed only natural. Are you a fan of the format, do you have a lot of 7"'s? Yes, and yes. I stopped acquiring them though because having to move often tends to make you re-evaluate what is worth having and what is not. I often go through this phase where I want to give everything away but I always get to my records and think, "Nah...not yet." 500. I mean, 490 too many. Seriously did this air guitar thing take over your life? Or has it calmed down a little. Are you back to defend the title this year? It has been a very wild ride. Just in the last month I have been flown to Mexico to be "Valedictorian for Air Guitar Mexico", gone on the US Air Guitar tour bus (no, seriously) and performed to sold out crowds, and been on both NBC and ABC national news 4 times. And for what? NOT playing guitar, that's what. Weird, very weird. Who knew all I had to do was take *off* the guitar to find success in music?! Email Hot Lixx at craigums(at)thelovesongs.com for info on how to obtain this silent masterpiece and in the meantime Craig is frequenting NYC with a few of his many projects, including defending his title August 16th at Irving Plaza...unfortunately his strategy secrets were off the record, other than.... it involves neon orange spandex. I first ran into Craigums outside a Pizza joint in Davis, CA he handed me a Your Mother flyer, at the time I never would have thought this guy is gonna be the world air guitar champion... anyway I also picked up the 7" because I thought it was funny!